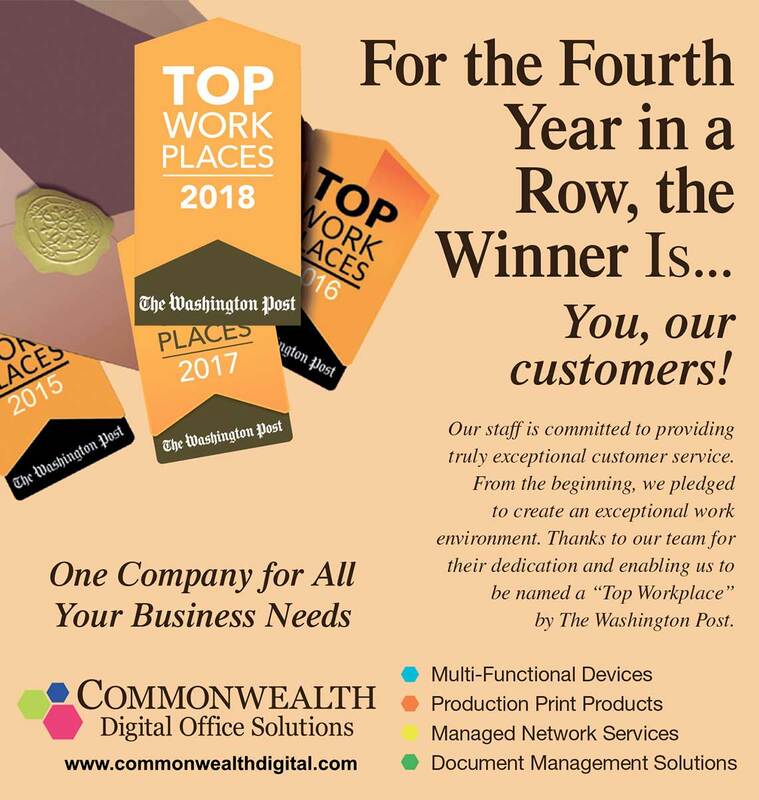 Washington Post Names Commonwealth Digital Office Solutions a Top Workplace Fourth Year In A Row! Commonwealth has been named to the Washington Post’s 2018 Top Workplaces list–the fourth year in a row that we’ve earned this prestigious honor. The Washington Post’s annual listing celebrates a select group of 150 companies in a range of sizes that have earned the highest ratings from their employees. Commonwealth is one of just 65 small businesses named to the list–and one of the smallest companies on the list. According to the Washington Post, Commonwealth “epitomizes what people like about small businesses.” This brief phrase highlights the secret to our success in a nutshell. From the earliest days of our company, we have demonstrated an old-fashioned commitment to our employees–which translates to the very best service for our clients. In an increasingly volatile employment marketplace, Commonwealth’s track record of employee retention is phenomenal. We have numerous employees who have been part of our team for decades, and the average tenure in our service department is 22 years. This commitment to retention means preserving institutional knowledge and offering better service to clients who interact with employees they know and trust day in and day out, year after year. Commonwealth is a family-owned company and our commitment to family is one of the qualities routinely mentioned by our employees. This year, the Washington Post highlighted the fact that our CEO pays children for their time when parents bring them into the office, a fun and meaningful demonstration of our family values. But our commitment to family goes way beyond fun activities. At the heart of our commitment to family is our philosophy that excellent benefit packages allow employees to ensure their families’ health and well-being. In an era where great benefits are increasingly hard to come by, they remain a priority at Commonwealth. Year after year, the Washington Post has highlighted the amazing trips Commonwealth offers to top employees. We strongly believe that incentives and rewards are an important way to recognize a job well done. And what better reward than travel to some of the most exciting places in the world. Our company-sponsored cruises are always a hit. And our employees love our Camp Commonwealth trips to Nunavut Canada near the Arctic Circle, where we offer accommodations on a private 80-mile lake and include special guests including disabled veterans. Employee trips are a fantastic reward but are also an important team-building exercise, allowing our team members to spend relaxed quality time with colleagues. Importantly, our trips are not just bonuses for top salespeople. We also include technicians, administrative employees and customer service teams based on length of service. 52,000 employees from companies around the D.C. region participated in the Post’s survey. And feedback from our small team has made an impression for the last three years. Our team is the heart and soul of our business. Because our employees feel valued and appreciated, they are inspired to give the very best customer service. It’s a positive cycle we are very proud of. Outside recognition is meaningful, but the feedback we get from clients is even more important. Our clients routinely mention the warm and supportive work environment at Commonwealth. Our business is based heavily on great products and technology. But human capital is the single most important element of any business. And as Commonwealth has proven for decades, happy employees are the most productive and ready to go the extra mile for clients.